Achieve classic 1920s Gatsby glamour with this heirloom-worthy statement hair comb. A divine crystal hair piece for weddings or glitzy balls. 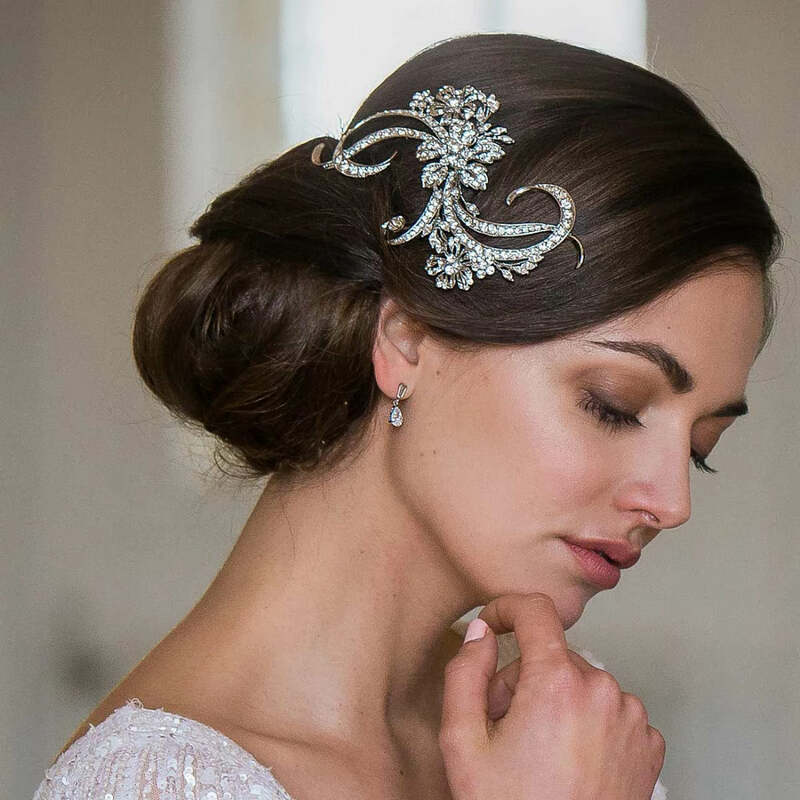 Simply sensational, Twenties Extravagance Hair Comb incorporates the glamour and excitement of the Gatsby era with every sparkle. Featuring jewel encrusted swirls which scroll around silver tone glittering flowers, the beauty of this piece is infinite. The clear Austrian crystals give this 1920s beauty the characteristic of being an heirloom treasure which has been discovered in a little antique shop and is crying out to be gracing the dance floor once more. For fans of Great Gatsby glamour, Twenties Extravagance will sit at the side of the head dressing up trade mark Marcel waves or will look just as divine accessorising a chic side chignon or elegant French pleat. For a glamorous black tie ball team with geometric drop earrings and your style will be jaw-dropping gorgeous. 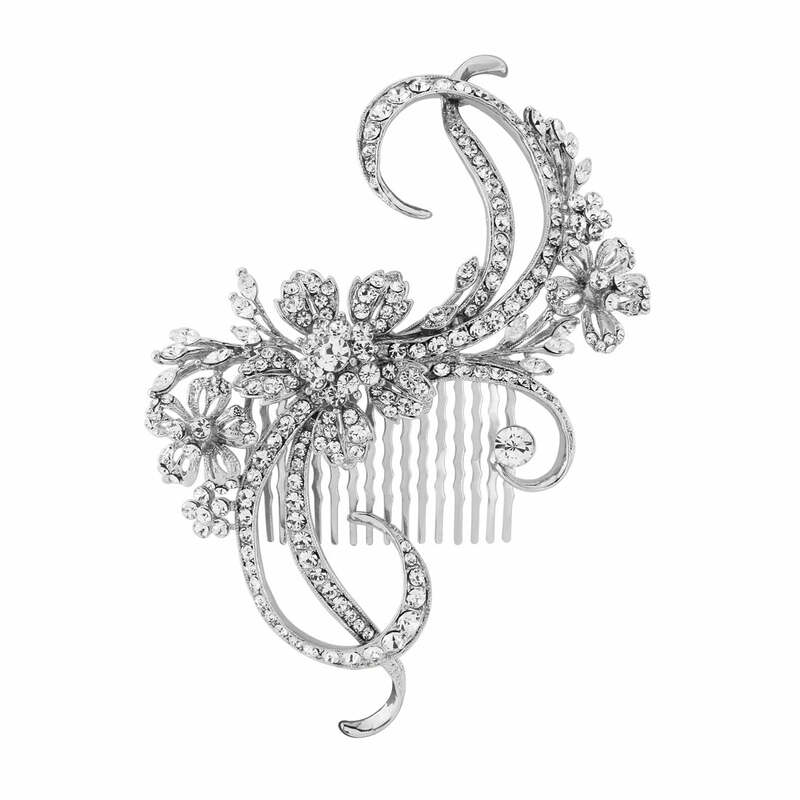 A truly beautiful bridal wedding hair comb, the intricacy of this vintage inspired piece makes it a versatile choice. It will look equally at home with a drop waisted 1920s gown or glistening alongside a delicate lace design with scroll details. Whatever your style, you are sure to receive endless compliments for your exquisite choice of hair accessory.